ou can download the game rules! A Call is put out to all ACME agents to figure out Where in the World is Carmen Sandiego?!?! It looks like Carmen’s gang has pulled another caper. In the Where in the World is Carmen Sandiego? 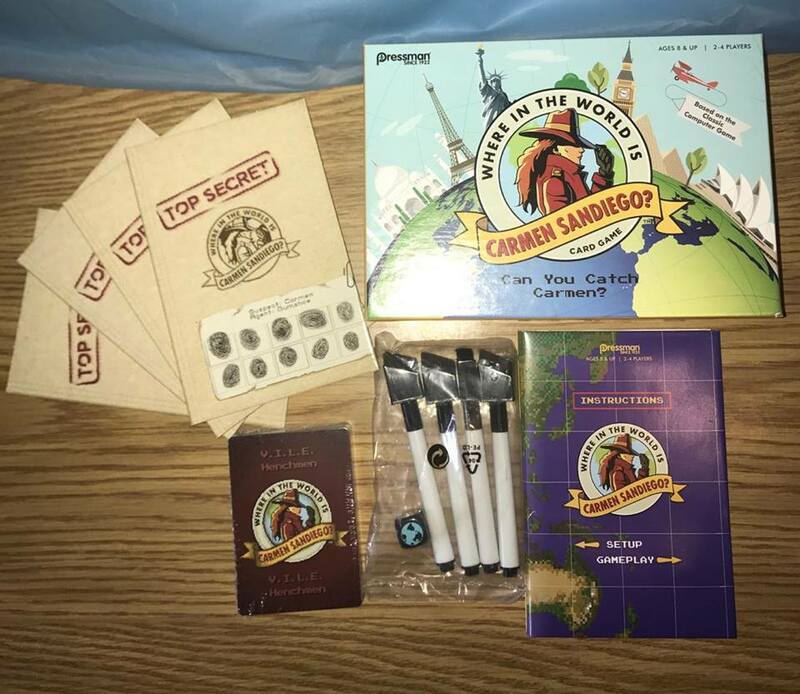 Card Game, players are on a top-secret mission to recover the greatest treasures known to mankind, The Grand Canyon, the Statue of Liberty’s Torch, and more. Your assignment is to apprehend Carmen Sandiego, track the location of her hideout, and determine which loot she stole. Your goal is to eliminate as many loot, location, and henchman cards as possible by finding the matching loot and location cards. This will lead you to Carmen Sandiego and one loot location card set. Players must be vigilant in collecting evidence to solve this mystery. In players top secret evidence journals they will keep track of fellow Players cards by writing down their location and loot cards and whether they’re at the top, center, or bottom of their piles. 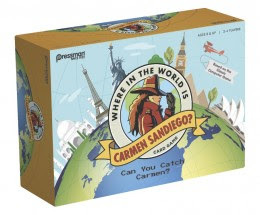 If players do not know where Carmen is but think they have discovered matching loot and location cards, call out “I have a warrant!” Once the player zeros in on Carmen’s location, you must declare “I have a warrant for Carmen’s arrest.” The first player to make a loot location match and successfully reveal Carmen wins the game. But, if you make an incorrect accusation, Carmen can escape! Where in the World is Carmen Sandiego is loads of fun. We found they were spot on with the age group of players. The younger ones were confused and didn't have as much fun as our older ones did. Our teens stayed up playing long after we went to bed! I use to watch this with my son all of the time when he was young. This is a great way for kids to learn geography and learn problem solving. So cool!I remember watching a cartoon of this when I was younger! This would be great for those studying geography! I remember the name but that is about all. This does seem like a fun game for the entire family.